I don’t know if you check the NFL.com website to view game stats, but if you do you might have noticed a huge error. Looking at the live game stats during the Pro Bowl, I noticed they had the divisional teams labeled incorrectly. If you look at the screen shot below, notice the players listed under the divisional titles. That’s right. According to the NFL, Aaron Rodgers (Quarterback for the Minnesota Vikings) is a member of AFC. The same holds true for Donovan McNabb, Quarterback of the Philadelphia Eagles. I wonder when they will notice their error. Here is another beautiful steam train for you. If the train looks familiar, then I have to guess you’ve seen one of the Harry Potter movies. This train, operating from Fort William to Mallaig in Scotland. As you travel along the rails, you take in the stunning scenery that Scotland has to provide, including views of the Glenfinnan Monument and Loch Shiel as it crosses over the Glenfinnan viaduct. This 110 year old consists of 21 individual arcs, giving this concrete bridge a spectacular architectural appeal. 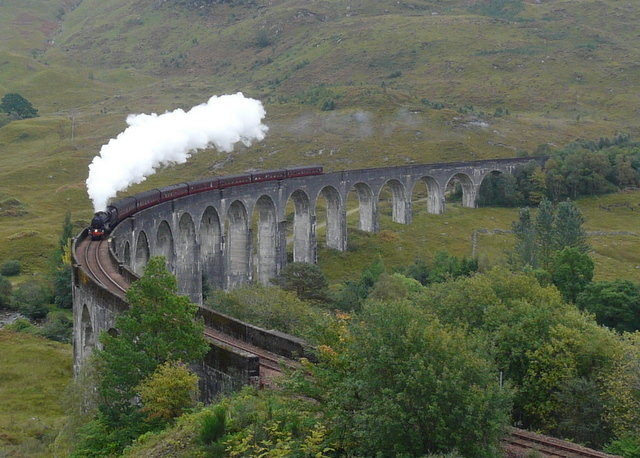 The bridge, just like the Jacobite steam train, has also been featured in the Harry Potter series. One of the best things about the internet is that you get to meet new people from around the world. In the old days, we would have pen pals where you would write (or type) a letter and mail it off to somewhere far away, hoping for a reply within a month. Today, all you need to do is turn on your computer, connect to the internet, and surf the web. I would like you to me the author from MagicMurcury from Sweden. He uses his blog to discuss his daily life as well as write articles of interest. One of his articles I came across reminded me of a conversation I was having today about smells. 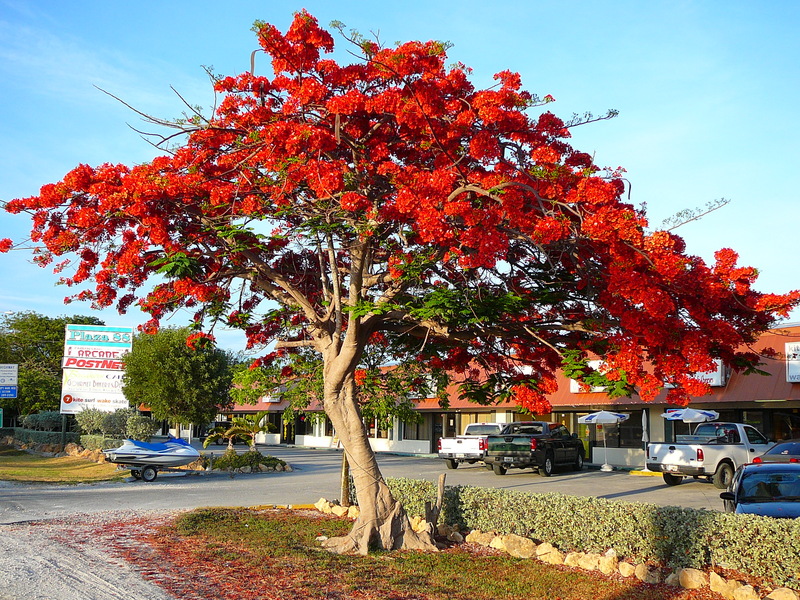 In his article “Reminiscence of childhood,” he discusses how scent of the blooms from the Gulmohar tree. The scents would remind him of his days a kid growing up, and how he would play with his friends on those trees. I have similar responses to scents from various ships I sailed on in the past. It is an uncontrollable response, since your memories are directly linked to various scents and smells. I’d like to thank the author for sharing his views on the world. I would encourage you to take a few minutes and visit his site. Maybe something he has written about will remind you of something in your own life. Have you seen this??? The pictures below are the before and after photos of the Palace in Haiti. The 7.0 earthquake caused the top floor to collapse. The building is a total loss. Pray for the Haitians in this time of need. You know me. I love my pizza. Almost every Friday night, you can find me cooking up a pie and getting ready for Sci-Fi Friday night. So, I wanted to bring this special offer to your attention. Tony’s Pizza wants to sponsor a pizza night for everyone to get together. I’m thinking that we can do a big Sci-Fi movie and/or television night if I am lucky enough to one of the few chosen to host the event. Who is interested? Just to make the night more interesting, Tony’s Pizza is offering a $500 Tech Prize Pack as a giveaway as well. Pizza, Sci-Fi, and prizes … what more could you ask for to kick off your weekend? Once I have more information, I will pass it on to you. In the mean time, Tony’s Pizza is also giving away a free game of bowling on their website. Visit their website for further details. You are currently browsing the MODU's Musings blog archives for January, 2010.